Keep your clothes neat and pressed with this steam iron that features vertical, burst and variable steam modes, 3 temperature settings with a fabric guide and a cool spray mist for selecting the optimal ironing settings for a variety of clothing. Provides simple operation and easy readability. 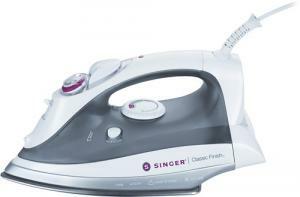 Provides ample power to iron your clothes. Help you select the optimal setting for your clothing. Offer plenty of steam options to best meet your needs. Provides extra moisture to help iron out tough wrinkles. Help prevent calcification buildup and water drips. Automatically shuts off for peace of mind.